World-class beaches are one of the reasons why private yachts and luxury yacht charters flock to the Caribbean. With some 28 island nations and more than 7,000 individual islands selecting the best beaches in the Caribbean is no small task but here are five of the finest to visit on a superyacht. 1. Cove Beach, Barbados While all the beaches in Barbados are public, access sometimes isn't, so if you can rent a property with its own beautiful patch of sand and sea you've gone for the best option. Blue Sky Luxury property Crystal Springs boasts its own stunning section of shore, from which guests at the villa can head off atop paddleboards, inflatables, towables and even tender out to a yacht or catamaran. 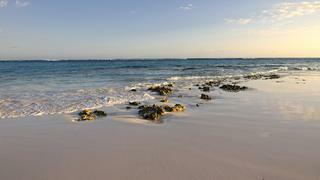 Its soft gold sand and views out over crystal clear waters make for the perfect place to relax alone with a book. As it's one of the best sunset spots in the Caribbean, guests can sit in beach chairs together and watch the astonishing red and pink skies with a Dark 'N' Stormy cocktail in hand. The Port St Charles Marina, which can host yachts up to 76 metres, is just a 10 minute drive away. 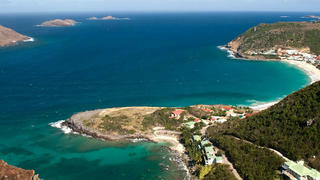 Otherwise, guests at Crystal Springs can drop anchor and tender in to Cove Beach. World-class beaches are one of the reasons why private yachts and luxury yacht charters flock to the Caribbean. With some 28 island nations and more than 7,000 individual islands selecting the best beaches in the Caribbean is no small task but here are five of the finest to visit on a superyacht. 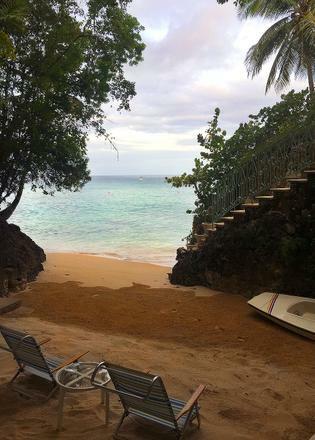 While all the beaches in Barbados are public, access sometimes isn't, so if you can rent a property with its own beautiful patch of sand and sea you've gone for the best option. Blue Sky Luxury property Crystal Springs boasts its own stunning section of shore, from which guests at the villa can head off atop paddleboards, inflatables, towables and even tender out to a yacht or catamaran. Its soft gold sand and views out over crystal clear waters make for the perfect place to relax alone with a book. As it's one of the best sunset spots in the Caribbean, guests can sit in beach chairs together and watch the astonishing red and pink skies with a Dark 'N' Stormy cocktail in hand. The Port St Charles Marina, which can host yachts up to 76 metres, is just a 10 minute drive away. 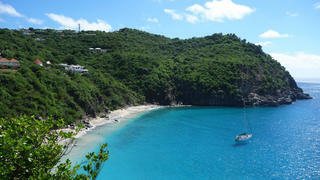 Otherwise, guests at Crystal Springs can drop anchor and tender in to Cove Beach. Making a rapid recovery from the hard-hitting hurricane season, St Barths' beaches are still some of the most beautiful in the Caribbean. Located just moments from Port Gustavia on stylish St Barths Shell Beach is a popular winter hangout for the island’s elite. As the name suggests the beach is actually made up of millions of tiny shells, one of only four shell beaches in the world. Restaurant Shellona has brought a buzz back to the beach. With a laid back vibe and French cuisine it’s the perfect place to enjoy a long lunch a bottle of rosé or two. If you manage to extend your lunch even further the beach is also one of the best Caribbean sunset spots. To visit you can either anchor out in the bay – the calm waters are ideal for testing your yacht’s toy box – or book a berth at the prestigious Port de Gustavia which is just a short walk away. Making a rapid recovery from the hard-hitting hurricane season, St Barths' beaches are still some of the most beautiful in the Caribbean. Located just moments from Port Gustavia on stylish St Barths Shell Beach is a popular winter hangout for the island’s elite. As the name suggests the beach is actually made up of millions of tiny shells, one of only four shell beaches in the world. Restaurant Shellona has brought a buzz back to the beach. With a laid back vibe and French cuisine it’s the perfect place to enjoy a long lunch a bottle of rosé or two. If you manage to extend your lunch even further the beach is also one of the best Caribbean sunset spots. To visit you can either anchor out in the bay – the calm waters are ideal for testing your yacht’s toy box – or book a berth at the prestigious Port de Gustavia which is just a short walk away. One of the most exclusive beaches in the Caribbean, Petit St Vincent offers a private island escape in a truly stunning setting, making it one of the best beaches in The Grenadines. Used entirely for a boutique beach resort, it’s the perfect place to go and switch off as there is no wifi, television or telephone use available. The gorgeous white sand beaches and 115 acres of luscious tropical forest should be enough to keep visitors occupied, and guests can entertain themselves with an array of water sports, one of the best luxury spas in the Caribbean, as well as two yoga pavilions and a wellness centre. If you’re spending a few days exploring St Vincent and The Grenadines on a luxury yacht, be sure to make a stop at Petit St Vincent, even if just for a sumptuous dinner in a truly spectacular setting — as far as Caribbean sunset spots go, this little island is quite remarkable. One of the most exclusive beaches in the Caribbean, Petit St Vincent offers a private island escape in a truly stunning setting, making it one of the best beaches in The Grenadines. Used entirely for a boutique beach resort, it’s the perfect place to go and switch off as there is no wifi, television or telephone use available. The gorgeous white sand beaches and 115 acres of luscious tropical forest should be enough to keep visitors occupied, and guests can entertain themselves with an array of water sports, one of the best luxury spas in the Caribbean, as well as two yoga pavilions and a wellness centre. If you’re spending a few days exploring St Vincent and The Grenadines on a luxury yacht, be sure to make a stop at Petit St Vincent, even if just for a sumptuous dinner in a truly spectacular setting — as far as Caribbean sunset spots go, this little island is quite remarkable. Turquoise waters, velvet sands and a few yachts at anchor in the near distance — Colombier Bay (or Anse de Colombier) in the greener north western corner of St Barths offers a quiet and tranquil alternative to the more vibrant beaches on the island, and one of the best picnic spots in the Caribbean. It's only accessible from the water or by two rural footpaths, one heading north east from Le Petit Morne Hotel and the other following the road west from Flamand Beach, the latter of which follows the coastline around the north of the island to Colombier Bay. St Barths is well-known for it's calm waters, so if hiking isn't your ideal way to spend an afternoon, drop anchor and tender into Colombier Bay. As part of the Réserve Naturelle Saint-Barthelemy, it is a great spot for diving or snorkelling and visitors to the bay can hope to see grey reef sharks, lobsters, turtles and eagle rays. Divers should head straight to the Kayali wreck, one of the best dive sites in the Caribbean, to see an enormous array of marine life. Turquoise waters, velvet sands and a few yachts at anchor in the near distance — Colombier Bay (or Anse de Colombier) in the greener north western corner of St Barths offers a quiet and tranquil alternative to the more vibrant beaches on the island, and one of the best picnic spots in the Caribbean. It's only accessible from the water or by two rural footpaths, one heading north east from Le Petit Morne Hotel and the other following the road west from Flamand Beach, the latter of which follows the coastline around the north of the island to Colombier Bay. St Barths is well-known for it's calm waters, so if hiking isn't your ideal way to spend an afternoon, drop anchor and tender into Colombier Bay. As part of the Réserve Naturelle Saint-Barthelemy, it is a great spot for diving or snorkelling and visitors to the bay can hope to see grey reef sharks, lobsters, turtles and eagle rays. Divers should head straight to the Kayali wreck, one of the best dive sites in the Caribbean, to see an enormous array of marine life. Considered to be one of the most beautiful beaches in the world, not just the Caribbean, Pink Sands’ looks almost salmon- coloured in appearance during sunset. The beach is three-miles of beautiful sand and crystal clear waters. Protected by the coral reef the waters are calm and perfect for swimming and snorkeling. Harbour Island is also considered to one of the best scuba diving spots in the Caribbean. Only accessible by boat Harbour Island has not been spoilt by mass tourism and it is well worth a stop off if you are on a private yacht or enjoying a luxury yacht charter in the Bahamas. Considered to be one of the most beautiful beaches in the world, not just the Caribbean, Pink Sands’ looks almost salmon- coloured in appearance during sunset. The beach is three-miles of beautiful sand and crystal clear waters. Protected by the coral reef the waters are calm and perfect for swimming and snorkeling. 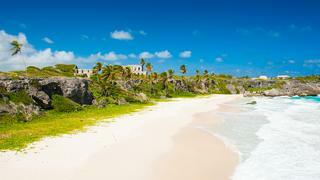 Harbour Island is also considered to one of the best scuba diving spots in the Caribbean. Only accessible by boat Harbour Island has not been spoilt by mass tourism and it is well worth a stop off if you are on a private yacht or enjoying a luxury yacht charter in the Bahamas. You may not want to spend the day talking to a ball with a face scrawled on it, but you can make like Tom Hanks in the movie Castaway in every other sense on this beach. It is utterly remote and all the more beautiful for it. Ask your captain to head for the Parish of St. Philip near to Bottom Bay and take a tender to Harrismith beach. 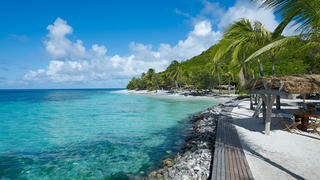 The peaceful nature of the place is a complete contrast to the “bling” vibe found elsewhere in Barbados. The only sign of civilisation is the ruin of an old plantation mansion that steadily crumbles and fades atop the cliff. There are no facilities or lifeguards here, which would only compromise the castaway fantasy anyway. It’s just the palm trees, powdery sand and a number of lagoons in which to enjoy the sea. Just don’t get carried away by the sensation of solitude and start shouting “Wilson” at random…. there might be a few other people who have heard of this splendid beach gem. You may not want to spend the day talking to a ball with a face scrawled on it, but you can make like Tom Hanks in the movie Castaway in every other sense on this beach. It is utterly remote and all the more beautiful for it. Ask your captain to head for the Parish of St. Philip near to Bottom Bay and take a tender to Harrismith beach. The peaceful nature of the place is a complete contrast to the “bling” vibe found elsewhere in Barbados. The only sign of civilisation is the ruin of an old plantation mansion that steadily crumbles and fades atop the cliff. There are no facilities or lifeguards here, which would only compromise the castaway fantasy anyway. It’s just the palm trees, powdery sand and a number of lagoons in which to enjoy the sea. Just don’t get carried away by the sensation of solitude and start shouting “Wilson” at random…. there might be a few other people who have heard of this splendid beach gem.